Vegetable Lasagna is what you make when you want to load up on veggies with something that’s filling, comforting and so moreish, you don’t even think twice about it being Meat Free! 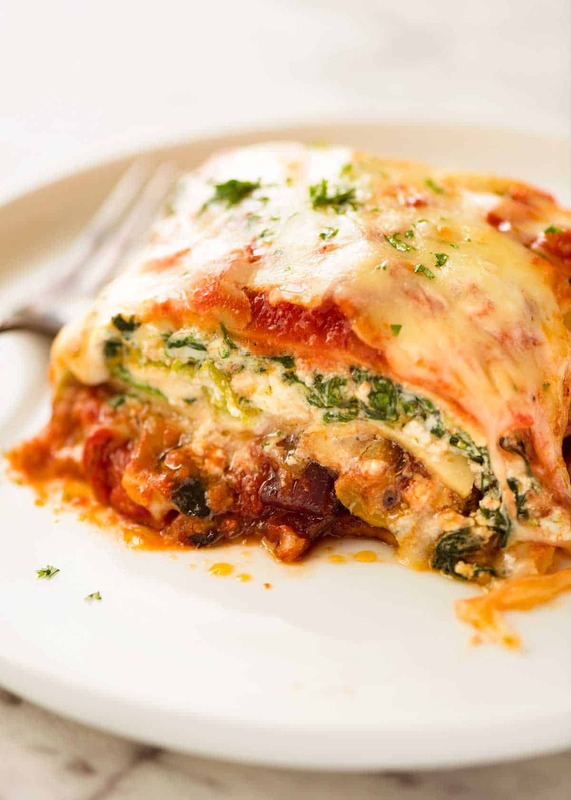 This incredible Vegetarian Lasagna is made with a creamy ricotta and spinach filling as well as layers of roasted vegetables and a homemade tomato lasagna sauce. 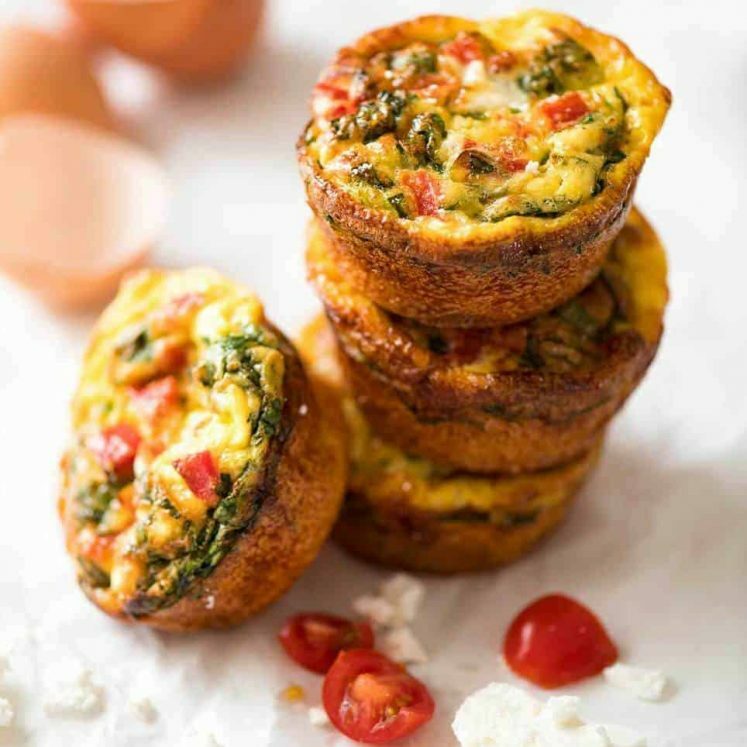 It’s one of my favourite fridge clean out recipes because it can be made with just about any roastable veggies! Simple homemade lasagna sauce – skip the jar, this homemade tomato sauce is simple and so good! 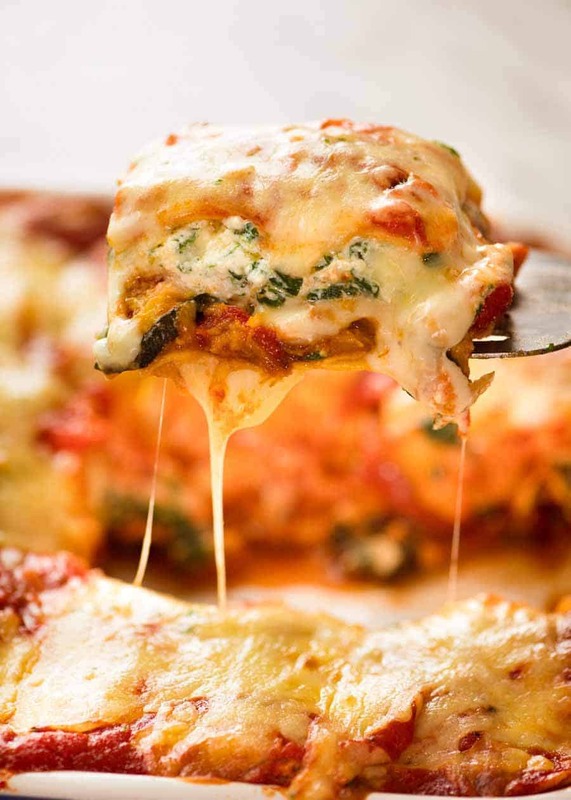 Cheese – goes without saying that melty cheese is all part of a great lasagna experience! There are a few components to putting together a Veggie Lasagna so we love that it makes a BIG batch and that it reheats 100% perfectly! Sprinkle with cheese. Ready to bake! I used pumpkin, zucchini and onion as my roasted veggies, but feel free to use whatever you have / want. Anything roastable is fine, just chop it so it cooks in the same time. I cut mine pretty chunky because otherwise they cook too quickly in the oven – I like to roast veggies for at least 20 minutes minimum to get the maximum benefit of caramelisation. My “special ingredient” – Roasted Red Peppers! Basically, it’s capsicum / bell peppers that have been fire roasted so they have that gorgeous smokey flavour. 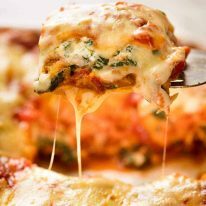 It’s sweet, soft and slippery and it adds an awesome extra dimension to this lasagna. Yep, I take the easy route and buy it in a jar but if you’re a keen bean, make your own! 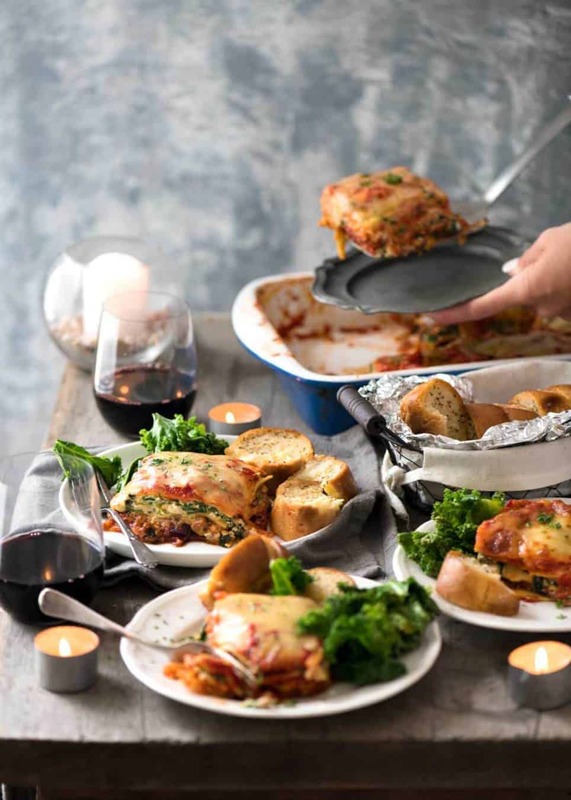 Vegetable lasagna is sensational served fresh out of the oven, but it’s also one of those dishes that are terrific the next day. 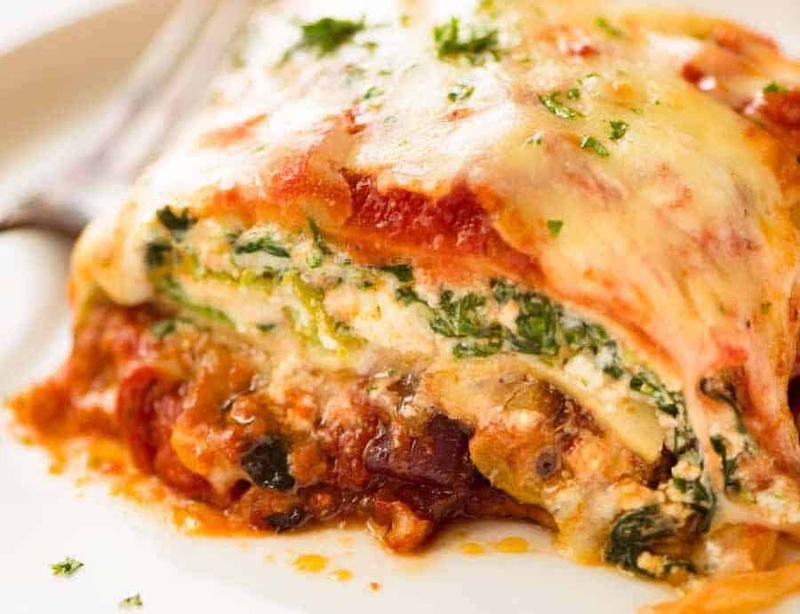 The flavour of those roasted veggies and that spinach ricotta layer develop overnight, and just a quick reheat in the microwave is all that’s required to bring it back to the original molten state. Chickpea Potato Curry – big curry flavours made with pantry staple spices! Sometimes it helps to have a visual, so watch me make this Vegetarian Lasagna recipe! Recipe VIDEO above. 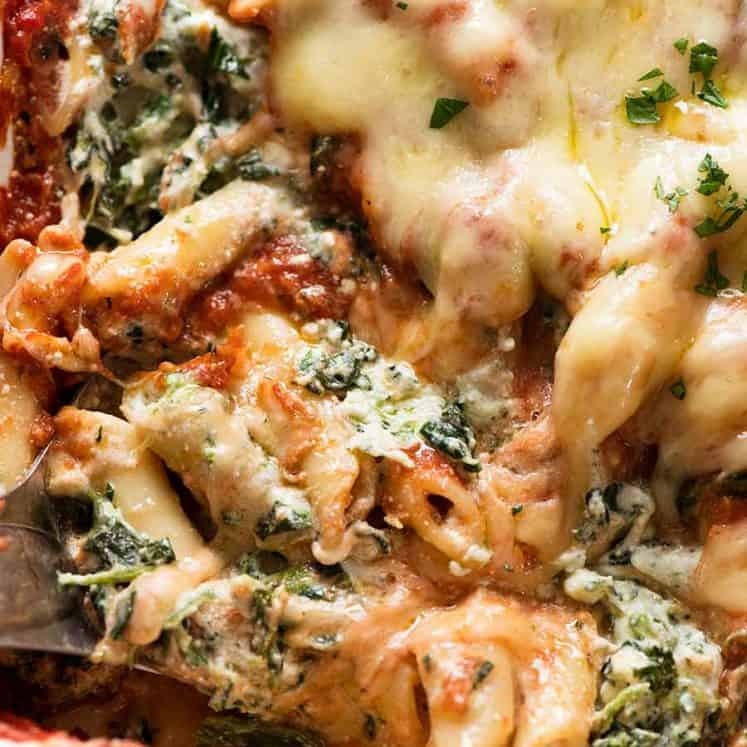 Layered with roasted vegetables, spinach and ricotta, a homemade sauce and as much cheese as you see fit, this big batch vegetarian lasagna reheats brilliantly. Epic meat-free food for carnivores! Place vegetables on the tray, drizzle with oil, sprinkle with garlic, salt and pepper. Toss. Roast for 25 minutes, turning at 15 minutes, until tender and browned. Remove from oven, loosen from tray with spatula while warm (can stick when cools). Heat oil in a skillet over medium high heat. Add garlic and onion, cook for 3 minutes until golden. Remove from stove and let cool for 5 minutes before using. Place ingredients in a bowl and mix until combined. Spread a ladle of tomato sauce on the base of a large baking dish (Note 5). Cover with lasagna sheets, tearing as required to fit. Top with roasted vegetables, scatter over red peppers. Spoon over 2 1/2 cups of Sauce, then sprinkle with half the cheese. Cover with lasagna sheets. Spread over Ricotta mixture. Cover with lasagna sheets. Pour over remaining sauce and sprinkle with remaining cheese. Bake for 25 - 30 minutes or until the cheese is golden. If using dried lasagna sheets, stick a knife in the middle to ensure it's cooked - if it needs longer, cover and stick it back in the oven. Rest for 5 minutes before cutting and serving. Store leftovers per notes - brilliant reheated! 1. 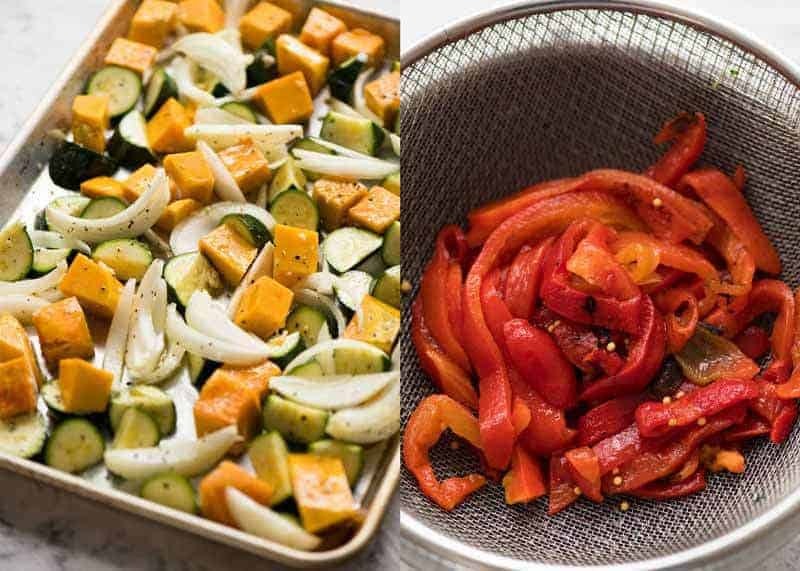 Veggies - feel free to use any vegetables you want, just cut them so they roast in around 20 to 25 minutes. Cauliflower, broccoli, carrots, squash are some I've used in the past. 2. Ricotta - It's best to get ricotta over the counter at the deli, even at supermarkets, rather than buying in tubs unless it's a brand you know is good like Paesanella. Harris Farms brand ricotta is also good. I find ricotta in tubs at supermarkets is typically grainy and kind of powdery - even the "big" brands (like Perfect Italiano). 3. Tomato passata is pureed tomato, just plain tomato with no flavourings. It is so good for making sauces like this because it's smooth even without cooking it down for ages ie no tomato lumps. It comes in tall bottles and is better value than canned tomato (by weight). Found in the pasta aisle of supermarkets in Australia - it's becoming increasingly popular. I like to use a combination of passata and crushed tomato for for texture and flavour. If you can't find passata, use the same weight of crushed tomato. America - if you can't find tomato passata, use Tomato Puree or what you call Tomato Sauce. 4. Roasted Red Peppers - optional, adds sweetness and extra flavour dimension. I use Always Fresh. You could just add chopped capsicum / bell peppers to the roasted vegetables. 5. LASAGNA SHEETS: I like using fresh lasagne sheets sold in the fridge section. 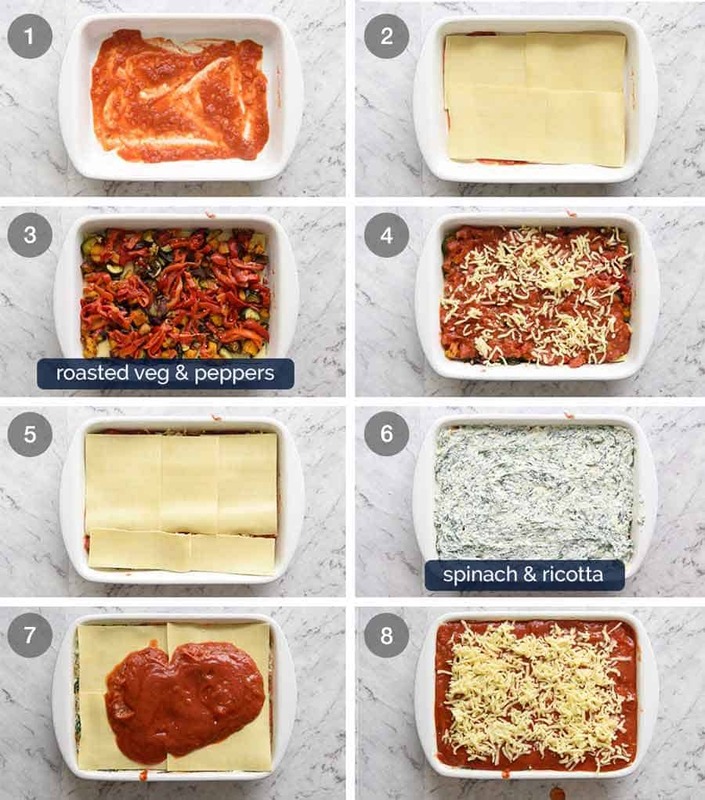 If you can only get dried, use No Boil sheets for convenience, or if required pre cooking, cook the lasagna sheets per the packet directions. If using dried instant / No Boil lasagne sheets, add an extra 1/2 cup of water into your sauce (because the lasagne sheets absorb liquid while cooking). Note, sometimes dried instant lasagna sheets usually end up with a buckled surface, but doesn't affect flavour. I prefer fresh lasagna because it doesn't absorb liquid while cooking so the lasagna stays really nice and saucy. SUB: Believe it or not, tortillas make an excellent substitute for lasagna sheets! Ideal gluten free option - use corn tortillas. 6. My baking pan is 33 x 22 x 7 cm / 13 x 9 x 2.5". 7. STORAGE: This keeps so well in both the fridge and freezer. Cool before covering, then refrigerate or freeze. Defrost before warming. I just reheat in the microwave, but you can also reheat in the oven. Make ahead: Best way is to assemble then refrigerate or freeze, then bake (defrosted) when required per recipe. 8. Nutrition per serving, assuming 10 servings. This Vegetarian Lasagna recipe was originally published February 2018. Updated for housekeeping matters. No change to recipe – I wouldn’t dare! I have the SAME problem every single time!! I liked the sound and look of this recipe though didn’t think it would taste as good as it actually. My husband is Italian and a big critic on lasagna and he even approved. Will 100% make again. Woah that’s a great thing to hear Sally! I have 2 questions for you. What is the difference between raw sugar and brown sugar and are they interchangeable in cooking? Secondly can you explain what you mean by broiling as opposed to baking or grilling. Thanks. Hi Nagi, I have just made your meat lasagna (lovely) and have left over sheets. Can the vegetarian lasagna be frozen? Hi Julie, yes it definitely can! 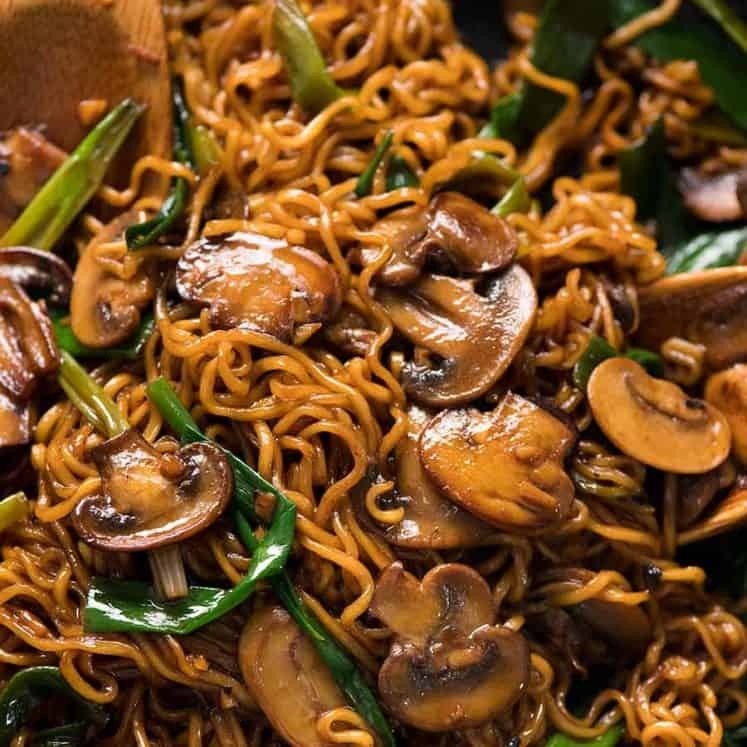 Thank you Nagi, I have made this recipe again and received very positive comments. Simple and easy steps to follow with a very taste result. I made this tonight with butternut squash, zucchini, and sweet potatoes…it was yummy! Made this last night…it was very, very tasty. I used frozen cubed butternut squash, which when thawed was too wet and goopy to brown properly in the oven. 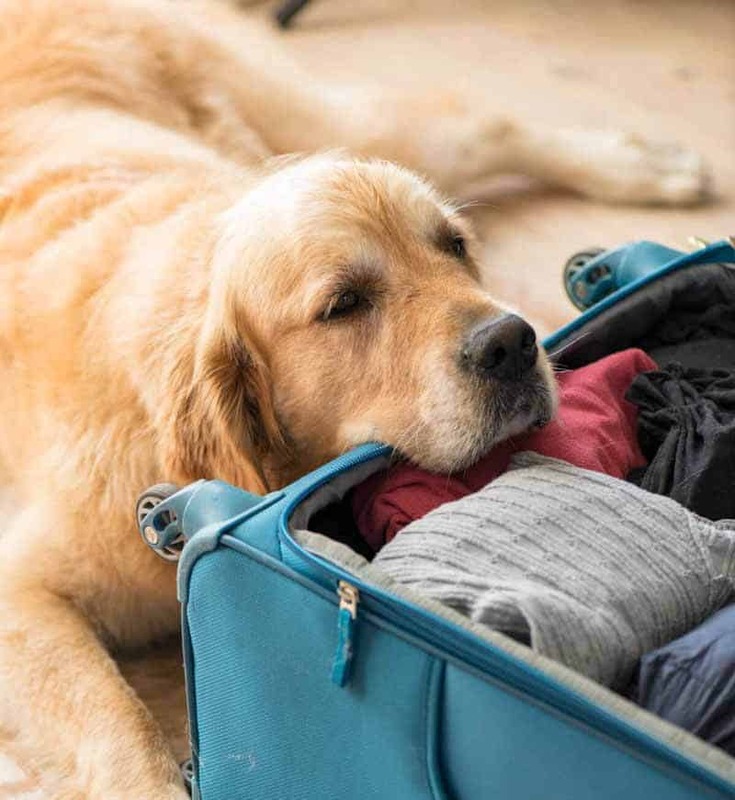 Won’t use that again! For those of you unfamiliar with the metric system, a 2 cm cube (chopping directions) is about 0.8 inch. I’m so glad you loved it anyway Janet!